Starting with payroll purchases made on or after April 18, 2016 Sage have implemented a new maintenance plan. This plan is specific to payroll and is in addition to the regular Business Care users pay for their other Sage 100 modules. Sage 100 Standard or Advanced US Payroll module (Compatibility: v2015 and v2016 Only). Sage 100 Direct Deposit module. Tax table updates (for supported versions) (2). Direct deposit services including the ability for Sage to pass the ACH file to the bank and automatically post these transactions to the customer’s general ledger (3). Unlimited support calls, chat and online resources for payroll or EFT/direct deposit file generation issues. Free Anytime Learning courses for payroll and direct deposit from Sage University. Selecting monthly payments allows a customer with seasonal or contract workers to lower their payroll tier with the next monthly payment. All customers may move up a payroll tier at any time. Requires Sage 100 (Standard or Advanced edition) with an active Sage Business Care plan. Not available with the Premium Edition of Sage 100. Payroll tax table updates and software upgrades will only be available with Sage 100 versions 2015 PU4 and 2016, and are limited to the period during which you are subscribed for payroll. Upon termination or expiration of such subscription, you shall no longer have access to any new payroll tax table updates or software upgrades nor any payroll tax table updates and software upgrades previously provided during such subscription period. Direct deposit services will only be available with Sage 100 versions 2015 PU4 and 2016. Direct deposit subject to customer’s acceptance of Sage Direct Deposit Services Agreement and successful completion of a credit check, fraud check and identification and verification assessment (which may include U.S. Patriot Act or other federal law requirements). 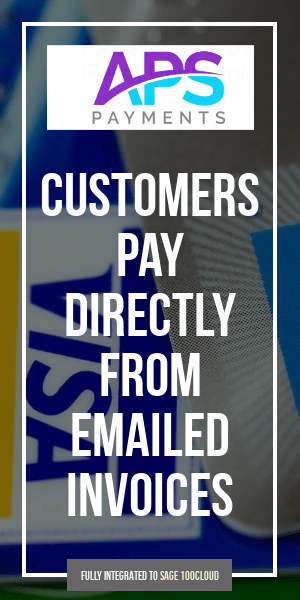 In addition to payroll subscription fees, customer is responsible for any ancillary fees imposed per transaction including, but not limited to, fees for late processing, prenotes, NSF, wire transfers and reverse wire transfers, returned items, funding bank fees, changes and/or deletions. Existing Sage 100 US Payroll customers will subscribe to Sage Payroll when their Sage Business Care plan renews. Customers may subscribe prior to renewal date. Payroll tier is determining by the number of paychecks processed for active employees during a pay period. Schulz Consulting provides consulting on Sage 100 to users of all versions. Our company office is located in Glastonbury Connecticut and we provide on-site service within Connecticut, New York, Rhode Island, Massachusetts, Vermont, New Hampshire and New Jersey. We offer unlimited remote support plans nationwide for all versions of Sage 100 and regularly provide ons-site and remote upgrades as well as additional training services. Sage 100 technical support and sales please call us at 860-657-8544 for more information or request Sage 100 support information here. 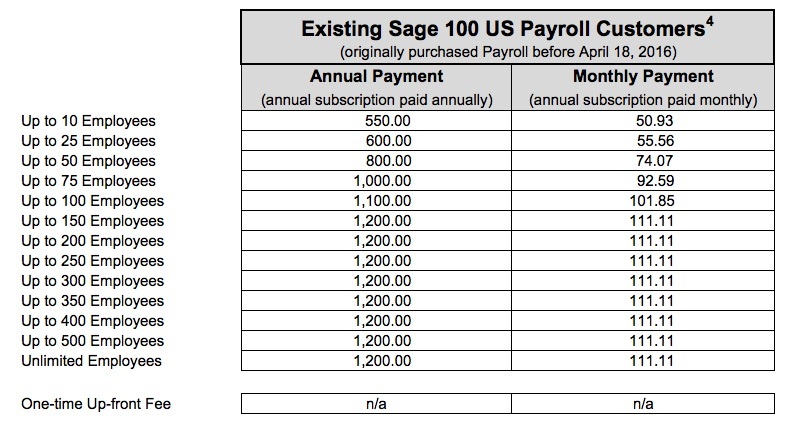 Why is Sage implementing a payroll subscription? Sage is changing the way it provides its customers with U.S. payroll. Sage is implementing a payroll subscription to base a customer’s cost for payroll on the range of employees for whom they process payroll. Customers that pay fewer employees will pay less for payroll than customers that pay more employees. Can a customer subscribe to Sage 100/100c or Sage 300/300c U.S. Payroll without using Sage 100/100c or Sage 300/300c as their ERP? No. A customer must have Sage 100/100c (Standard or Advanced Editions) or Sage 300/300c (Standard, Advanced or Premium Editions) in order to subscribe to Sage U.S. Payroll. Does a customer’s Sage Business Care plan for Sage 100/100c or Sage 300/300c need to be current to subscribe to the Sage 100/100c or Sage 300/300c U.S. Payroll subscriptions? Yes. Customers that want to subscribe to Sage 100/100c or Sage 300/300c U.S. Payroll must have a current Sage Business Care plan. 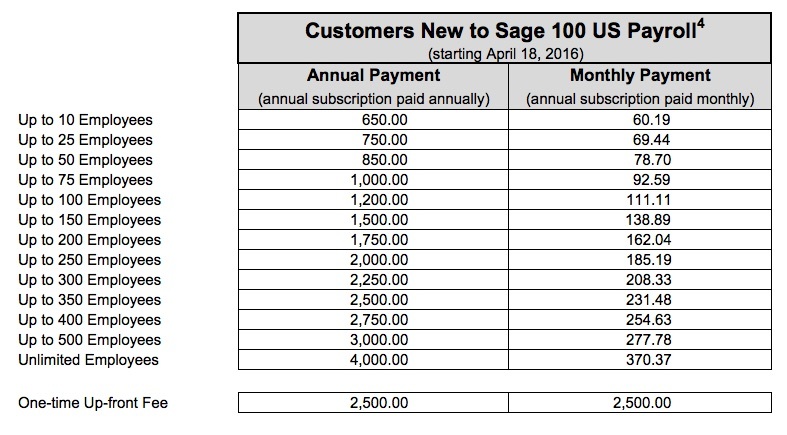 How does a customer pay for the Sage 100/100c or Sage 300/300c U.S. Payroll subscription? The subscription is processed as an automatic debit from a customer’s credit card or as an ACH debit transaction from their bank account. Customers cannot pay for the subscription using a check. A customer’s subscription will automatically renew on the anniversary of the subscription date, and the customer will be billed for the subscription automatically without notice from Sage. Sage payroll tier billing point of contact – 866-996-7241, option 3. Are Aatrix W-2 and 1099 e-filing services included in the Sage 100/100c and Sage 300/300c U.S. Payroll subscriptions? Aatrix W-2 and 1099 e-filing services are not included in the Sage 100/100c and Sage 300/300c U.S. Payroll subscriptions at this time. The cost for these services is additional. Printing of forms through Aatrix is still no cost for subscribers. On what date do Sage 100/100c and Sage 300/300c customers need to subscribe to Sage U.S. Payroll? Starting May 1, 2016, existing Sage 100/100c and Sage 300/300c U.S. Payroll module customers will be asked to subscribe to payroll on their Sage Business Care renewal date. How is a customer’s payroll tier determined? A customer’s payroll tier is determined by counting the number of employees that are marked “Active” in the U.S. Payroll module on the employee maintenance screen and identifying from these the number for whom the customer processes a paycheck during a specified pay period. Employees that are in archived, backed up, or in separate databases of the payroll software should only be considered in a tier calculation if they are active and employees for whom a paycheck will be processed. How does Sage know how many employees are active and an employee is being paid? Sage uses the employee status marked in the Payroll module employee maintenance screen under the main tab to determine if an employee is active. Any employee with an active status on this screen will be considered active for calculating payroll tiers. Active employees are those for whom the payroll software calculates payroll taxes during a given pay period. Customers that want to change an employee’s status can do so by selecting “change employee status” from the Payroll employee maintenance screen under the main tab and selecting the appropriate status from the drop-down menu.